Hundreds of students from Durham’s Jordan High participated in the walkout. Tallulah Cloos, 18, sometimes ponders ideal hiding spots if an active shooter were ever to terrorize her Buncombe County high school. It’s not easy, she says. A.C. Reynolds High, located just southeast of Asheville, has a wide campus with an abundance of open spaces. Cloos isn’t the only one. Multiple North Carolina teens who spoke to Policy Watch this week talked of harrowing conversations inside school about how they would respond to a campus shooter, one month after a gunman wielding an assault rifle allegedly killed 17 at a Parkland, Fla., high school. The anniversary of the Parkland shooting triggered an avalanche of campus protests across North Carolina and the United States Wednesday. Students at an estimated 3,000 U.S. schools walked out of classes for 17 minutes to memorialize those killed at the Florida school and to demand gun reforms from state and federal policymakers. As of press time, most in North Carolina had gone off smoothly, although one Wake County school reportedly postponed their protest after the school received a threat. And in the Asheville area, students like Cloos said their walkout was put off by recent snowfall, which forced local school district leaders to cancel classes for the day. 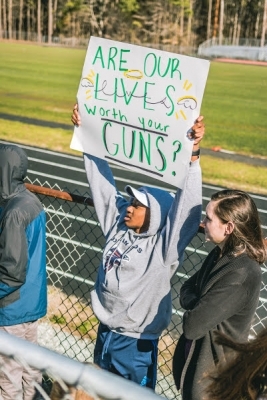 Yet Aminah Jenkins, a 17-year-old junior at Durham’s Charles E. Jordan High, estimated more than 800 students participated in a walkout at her school Wednesday. It’s the second walkout at Jordan High since the February shooting at Parkland, says Jenkins, and this one drew twice as many. Sen. Terry Van Duyn, a Buncombe County Democrat who serves as party whip in the state Senate, said the stories told by North Carolina students Wednesday reflect a new reality for K-12 pupils. Wednesday’s wave of walkouts was just one day of protests, but gun control advocates say they’re planning more demonstrations in the months to come. 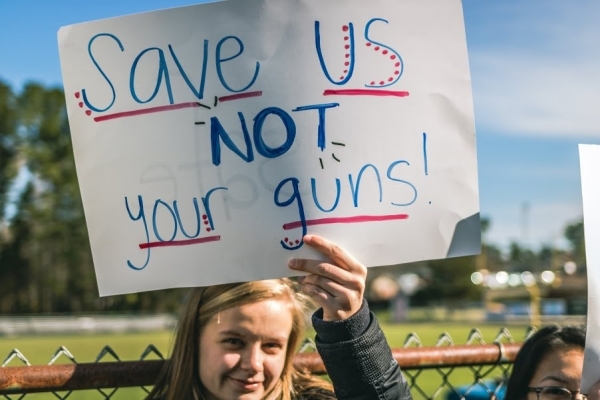 For K-12 students across the country, that will include a March 24 march on Washington, D.C.
Students in Parkland and across the country, including in North Carolina, have been actively organizing since the Valentine’s Day shooting in Florida. And while students in some states faced discipline for participating in Wednesday’s protests, there were no reports of similar activity in North Carolina by press time Wednesday. Nevertheless, the North Carolina chapter of the American Civil Liberties Union (ACLU) urged school administrators in an open letter signed by state ACLU Legal Director Chris Brook and attorney Sneha Shah not to punish students for taking part Wednesday. 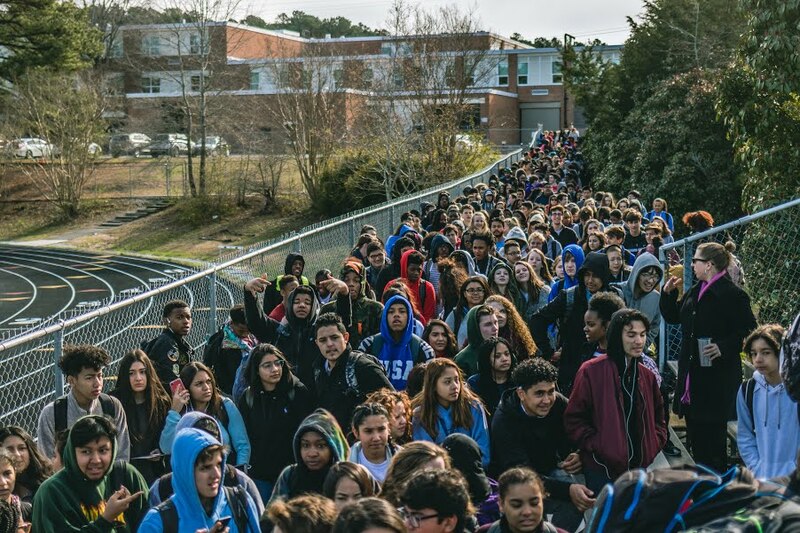 Hundreds of North Carolina students took part in the #NationalWalkout to protest gun violence. Mark Jewell, president of the N.C. Association of Educators, a Raleigh-based group that advocates for teachers, said the organization “wholeheartedly” applauds students for their involvement in the ongoing protests. Meanwhile, N.C. Superintendent of Public Instruction Mark Johnson said in a statement Tuesday that local districts would make the call on how to handle campus walkouts. 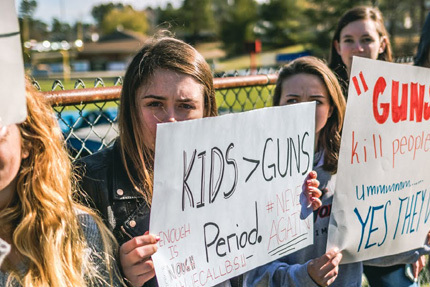 Students who spoke to Policy Watch say they hope the demonstrations galvanize North Carolina and U.S. legislators into some form of action, including new limitations on the use of AR-15 assault rifles and a higher minimum age for gun purchases. Likewise, Downey said she hopes the Durham protests will unify students. However, state House Speaker Tim Moore launched a select committee on school safety in February. GOP leaders on both committees did not respond to Policy Watch interview requests this week. Moore’s Republican-led select committee is expected to hold its first meeting next week, and some conservative lawmakers have already spoken openly about the controversial prospect of arming teachers. Gun rights groups say policymakers should eliminate “gun-free zones,” areas like schools that they say are targeted because of a lack of armed intervention. North Carolina gun control advocates bristled at those recommendations this week. And Jewell called it “one of the most dangerous ideas” he’s ever heard. Indeed, students who talked to Policy Watch this week said they believe arming teachers will only make students more fearful in schools. “What we’re trying to do is provide a safe environment where people are comfortable learning,” said Downey. And these days, after Parkland, students no longer feel that’s a sure thing, says Cloos.